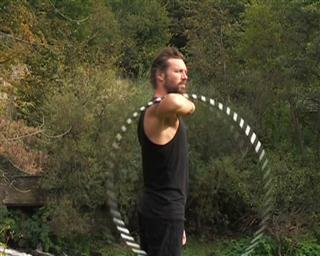 Moving the hoop from elbow to arm is simple and looks good when done with both arms simultaneously. 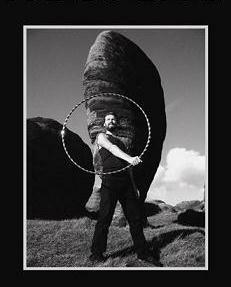 On this page I'll try to explain how to move the hoop from the elbow to the arm and then back again. I often see people try to go from hand rolls to arm rolls without using the elbow as an intermediate point. This can be done but it takes skill to do well. It's more likely to end in a smack to the head or one more broken ornament. It takes a small amount of energy to keep the hoop doing what it's doing. Trying to move the hoop against it's flow takes a lot of effort and oftens causes unforseen results (usually a smack to the head. 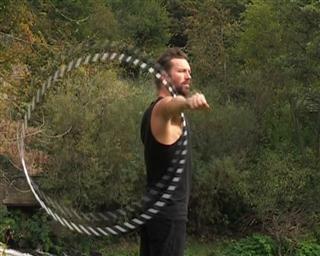 This method enables you to hoop on different parts of your body but the hoop effectively stays where it is throughout. 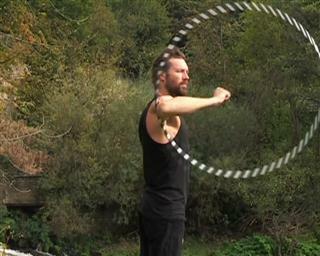 Get ready to push your arm through, as the hoop comes up to its highest point. The movement starts as the hoop falls away from your wrist. Until your arm is fully extended. 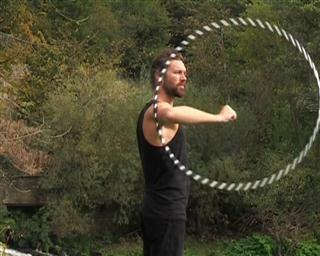 Keep the hoop going on your arm by making small circles. 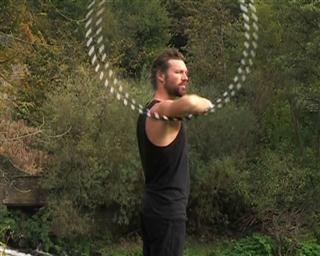 Remember to keep your arm level or the hoop will start to move down the incline of your arm. Now that you can keep the hoop going on your arm you need to take it back to your elbow. 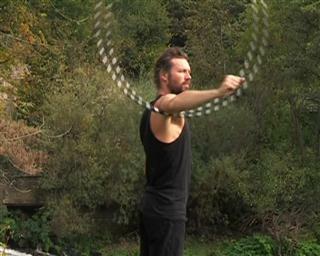 This movement also starts when the hoop is at its highest point. 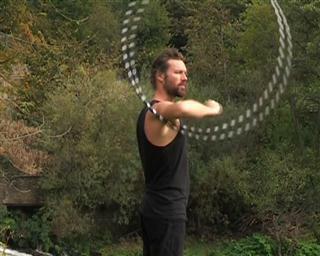 Start to pull the arm back through the space in the hoop. Until your hand is back by your chest. and bringing it back on every rotation.